Often times, photographs and slides found in the Amtrak Archives have no identifying information. Picking out familiar elements can help narrow down the possibilities of time and place, and sometimes, the knowledge of colleagues and readers like you is key to unlocking a mystery. Red Caps load and unload baggage and parcels from a baggage cart at Fort Worth Union Depot. When we originally posted this slide to this website in July 2015, it was labeled “Red Caps Working at a Southwest station,” because we didn’t know the exact location. 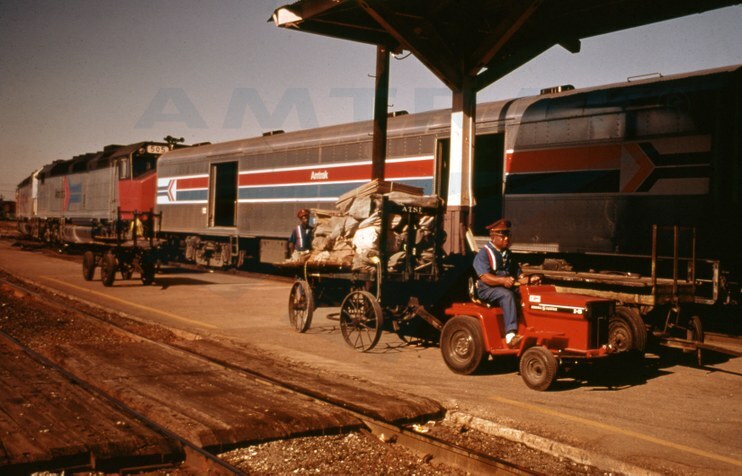 We assumed it was somewhere in the Southwest because the old baggage cart being pulled by the red tractor has “ATSF” stenciled on it in white paint. The ATSF stands for the Atchinson, Topeka and Santa Fe Railway. Founded in Atchison, Kan., in 1859, construction on the railroad began in 1869, and its lines eventually spread across the greater Southwest and into California. An Amtrak colleague, through a little research, determined that the canopy supports were similar to ones used at Union Depot in Fort Worth, Texas, which Amtrak served from 1971 until early 2002 when it moved a few blocks north to the new Fort Worth Intermodal Transportation Center (ITC). 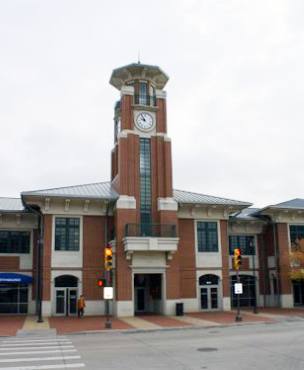 The ITC brings together the services of Amtrak via the Texas Eagle (Chicago-Fort Worth/Los Angeles) and Heartland Flyer (Fort Worth-Oklahoma City); Trinity Railway Express commuter trains; and local and intercity buses. 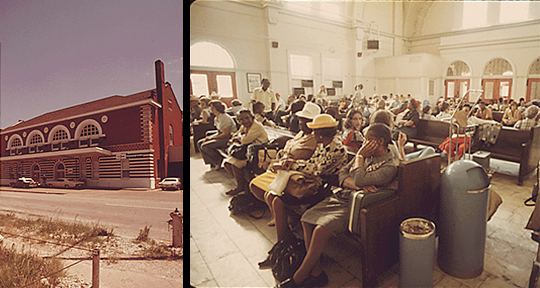 Fort Worth Union Depot as it appeared in June 1974; passengers wait in the light-filled waiting room. Images: Charles O'Rear / National Archives. Union Depot, constructed of red and buff brick with limestone trim, opened to rail passengers in 1899. It features a soaring, two-story waiting room with barrel-vaulted ceiling and marble floors. Stained glass windows have insets depicting the history of transportation as represented by a covered wagon, Pony Express rider and a steam locomotive. Union Depot was used by various railroads until 1960, when the ATSF became the sole occupant – later followed by Amtrak. The building was listed on the National Register of Historic Places and designated a Recorded Texas Historic Landmark in 1970. With Amtrak’s departure, new owners rehabilitated Union Depot, which now reflects its original beauty and functions as a popular meeting and banquet facility. 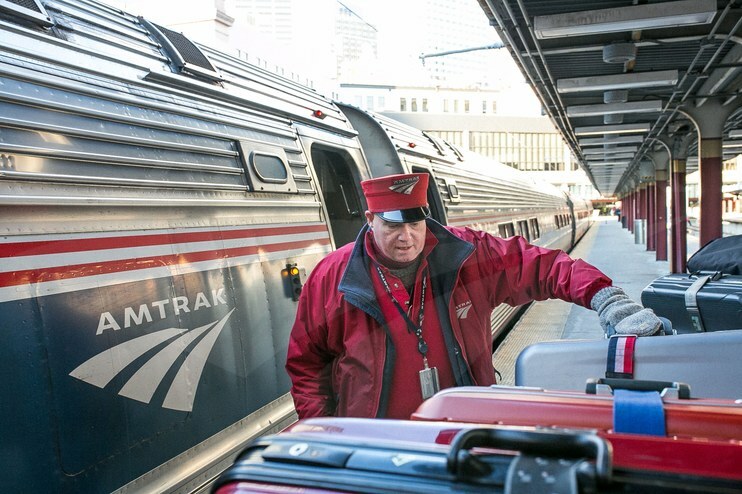 Red Caps, such as the two gentlemen shown in the image, generally work at major metropolitan stations, where among other tasks they help customers with baggage and assist them in boarding and alighting from the train. Here they wear a blue jumpsuit introduced in early 1972 as part of a redesign of uniforms worn by on-board service and station employees. Along with the red and white stripes, it incorporated all of the company’s brand colors. The employees of course also wear their trademark red hats. In the background, the baggage car features the Amtrak Phase II paint scheme introduced in 1975. Also clearly visible is SDP40F locomotive No. 505 wearing the earlier Phase I paint scheme. It includes the famous “red nose” on the head end and the first Amtrak service mark – an inverted arrow – on the side. The first locomotive built expressly for Amtrak, the SDP40F was a six-axle diesel unit that sported a 3,000-horsepower engine. It was manufactured in 1973-1974 by the General Motors Electro-Motive Division. Since many passenger rail cars were still heated via steam in the early 1970s, the SDP40F included two steam generators and a water tank. Within a decade, most of these locomotives were replaced with F40PH models that could operate more easily with the new and refurbished fleet of all-electric passenger cars utilizing modern head-end power. Although the exact date of this photo is unknown, we can reasonably narrow it down to the mid-1970s based on the Red Caps’ uniforms and equipment paint schemes. Glancing at the April 25, 1976 national timetable, Fort Worth Union Depot was served by the Inter-American (St. Louis-Little Rock-Fort Worth-Laredo) and the Lone Star (Chicago-Oklahoma City-Dallas/Houston). At Laredo, Inter-American customers could cross the border to catch a National Railways of Mexico train to Mexico City via Monterrey and San Luis Potosi. Do you remember taking Amtrak from Fort Worth Union Depot, or traveling on the Inter-American or Lone Star? Share your memories with us below!